In case of tooth loss, implantations enable a nearly nature-identical re-establishment of the dentition. Thus a bridge preparation for healthy adjacent teeth can be avoided, if only a single tooth is lost. Bigger gaps in the dentition can be narrowed by implants. Thereby the prosthetic solution is smaller and more resilient. Implant fixed single crowns or small bridges are indirectly stabilizing through periodontitis loosened teeth. 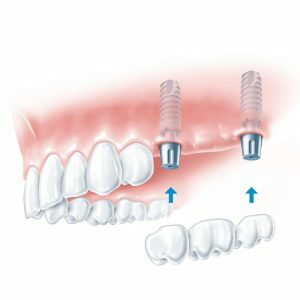 Another important option is the removable dental prosthesis, which is supported by artificial roots and a connecting element and is thereby fixed on the jaw. 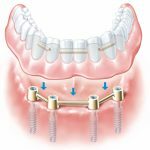 It isn’t uncommon that before or during the implantation of the artificial root the lost bone must be rebuild to attach the implant on the jaw. Several methods and materials can be used for treatment, depending on the extent of the loss. Suitable and high quality biomaterials support the therapeutic goal. The surgical difficulty and individual reaction influences the decision, if the intervention has to be done through sedation or anaesthesia. In easier cases a local anaesthesia is sufficient, too. The possible swelling of the cheek or bruise disappears mostly after 3 to 7 days. The healing process can be supported with medicine or cooling. A recovery after the surgery is very important. Nowadays, the lack of space in the dentition is very common and implicates a disadvantageous situation of the wisdom teeth. Especially the dental hygiene of partly erupted wisdom teeth can only be executed insufficiently. Therefore, it is recommended to remove the teeth, ideally between the age of 18 and 25. This enables the prevention of inflammatory and painful pocket infections, caries at the molar in front or narrowing of the teeth distance. The surgical difficulty and individual reaction influences the decision, if the intervention has to be done through sedation or anaesthesia. In easier cases a local anaesthesia is sufficient, too. The possible swelling of the cheek or bruise disappears mostly after 3 to 7 days. The healing process can be supported with medicine or cooling. A recovery after the surgery is very important. If an inflammation is remaining at the root tip, it needs to be cut off surgically. Usually, a local anaesthesia is given. It is a very common surgery, if root canal treatment alone doesn’t lead to healing. After the gum is lift away from the bone, the root has to be easily accessible and then cut off. Then the canal system gets cleaned and sealed. Finally, the wound is closed with stitches. The swelling of the cheek diminishes after 3 to 7 days und can be supported by medicine or cooling. A recovery after the surgery is very important. To replace lost gum, there are several types of surgery. Especially with and after bone augmentation measures or very long tooth necks it is necessary for the improvement of tooth cleaning measures and protection of the tooth necks that enough fixed gum is existing. With interventions like these, it is possible to enhance long-range prognosis of the teeth or the implants. Questions and details will be clarified through an individual counselling interview. Therapy options like the replantation of teeth at the same position or at another position (transplantation) are used less frequently nowadays. Nevertheless, there are advantages like the formation of the cuff build by the gum in the tooth neck area or positive interdependencies between the jawbone and the periodontal ligament. It is mostly used as an alternative for apicoectomy in inaccessible jaw areas with the Zalex procedure. Questions and details will be clarified through an individual conversation. The causes for periodontitis are several bacterial working stocks. In addition, there are further influences such as smoking, genetic factors and an unfavourable tooth position. For some forms of the disease that include deep bone pockets specific regenerative pocket therapies are feasible after an appropriate pre-treatment. Goals of this therapy are the stabilization of the periodontium and the avoidance of inflammations. Questions and details will be clarified through an individual counselling interview. To preserve acute inflamed, apically inflamed or dead teeth, root canal treatments are almost inevitable. It aims to become pain-free and to have as few bacteria as possible in the root canal system. Modern procedures help calcified and mostly older teeth to improve the result of complete root filling. Questions and details will be clarified through an individual counselling interview. With high resolution of the X-ray machine, low radiation exposure and optimal positioning of the jaw we are able to get an excellent display of the dental and jaw structure. It is possible to spot and treat anatomical anomalies and pathological processes in hard tissues faster due to greater resolution. With cross-sectional imagining we can look more closely at jaw and make more accurate statements for the surgery. With small digital dental X-ray images that are directly made in our treatment rooms the dental structure is shown more precisely. That way, we can make a faster and reliable diagnosis that reveals the cause for caries or toothache. Special diagnostic measures can help discovering the disease and its prognosis as well as therapeutic measures such as special splints or individual denture. Our lab, which is directly connected with our dental surgery, gives you advantages like an easier treatment process and better coordination between dentist and dental laboratory technology. Our laboratory takes preparatory steps for more extensive denture provision, denture cleaning as well as the production of an all-ceramic single tooth replacement and various splints. The denture shaping and production get more individual and flexible and therefore the dentures aren’t mass-produced goods but a combination of individual design, dental technological art with chewing comfort and aesthetic requirements. The all-ceramic crown is an alternative in addition to metal crowns or veneered crowns on metal caps. The aesthetic features are enhanced and allow high quality solutions, especially in the visible front teeth region and the transition to the gum as well as for partial preparations such as veneers in the front teeth region. Due to the great variety of crown types a functional and anatomic selection is important and therefore requires guidance and indication recommendation. The brightening of teeth can be performed on caries free or pre-treated teeth through the application of buffered bleach under illumination. Before we can bleach your teeth a check up and, if needed, a pre-treatment are required. The whitening of your teeth can improve the attractiveness of your smile and appearance.